Alexander Arms introduced 6.5mm Grendel ammo in 2003 was designed for the AR-15 and has also been adapted to other platforms. It is intended to improve on the performance of the default .223 Rem / 5.56 NATO chambering of the AR platform in the 200 to 800 yard range. 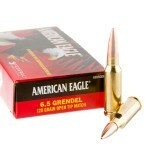 The wide case and long bullet of 6.5mm Grendel ammo give it excellent powder capacity and external ballistics. The 6.5mm Grendel is based on the .220 Russian, a Soviet hunting cartridge, which is in turn derived from the ever-popular 7.62x39mm; however, it lacks the tapered case of the Eastern block rounds in order to facilitate proper function in the AR platform. Converting an AR-15 from .223 Remington or 5.56 NATO to 6.5mm Grendel requires a bolt change; however, standard AR magazines will work with only a slight reduction in capacity. A typical round of 6.5mm Grendel ammo fires a 120-130 grain bullet at a muzzle velocity of 2,500 to 2,700 feet per second. With soft point ammo, such a load is more than capable of taking deer and other midsize game. Lighter bullets are available for hunting coyotes and other varmints. 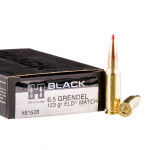 For target shooting, ammunition loaded with full metal jacket (FMJ) or open tipped match (OTM) bullets is also available. 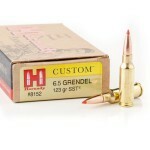 6.5mm Grendel ammunition is offered by a number of manufacturers including Prvi Partizan, Hornady (Custom) and Federal (American Eagle). 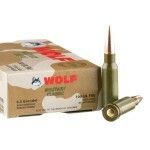 Wolf also manufactures an inexpensive steel-cased load in this caliber; while not reloadable, these rounds are great for high volume target shooting. Although originally intended for tactical use, the 6.5mm Grendel was not adopted by any military force until 2016, when a unit of the Serbian military adopted Zastava Arms sniper rifles chambered for it."